South Oaks Barrel Fermented Sauvignon Blanc – This small 2 hectare block is situated at the very southern elevated corner of the vineyard next to some old Oak trees. It has a unique free draining soil made up of crushed Greywacke rock that has fallen from the steep hill behind. AROMA: Ripe tropical fruit core featuring mango, juicy nectarine and citrus elements. Lifted notes of dry herbs, lime leaf, and gooseberry supplemented by complex aromas of honeycomb, vanilla bean and roasted hazelnut. PALATE: This wine displays tension and great length. The palate is tight and fresh, supported with a rich and creamy structure and underlying chalky minerality providing linear structure. The mouthfeel is intense and yet seamless and well balanced. WINEMAKER NOTES: The fruit is hand-picked into small baskets. At the winery it is hand sorted then gently whole bunch pressed, and the juice fermented in French oak barriques (20% new oak). After fermentation the wine is aged in French oak barrels on yeast lees for 10 months. VITICULTURIST NOTES: Vigour and fertility in this block is very low resulting from the high Greywacke rock content. As a result the vines are treated differently to normal Sauvignon Blanc with only 2 canes laid, shoot thinned to 16 shoots, hand leaf plucked with a high 80% exposure. Very small berried and open bunches are typical in this block, with an average cropping level of 2.5 kg per vine. At harvest the berries take on a blush appearance as it is ripened to around 24-25 Brix. One of the secrets to this block is that it holds its acidity level at high brix / ripeness levels. AROMA: Ripe tropical fruit core with mango, ripe passionfruit and citrus. Lifted notes of dry herbs and lime leaf, supplemented by complex aromas of honeycomb, vanilla bean and roasted hazelnut. AROMA: Ripe tropical fruit core with mango, passionfruit, lychee and citrus. Lifted notes of dry herbs and lime leaf, supplemented by complex aromas of honeycomb and roasted hazelnut. VITICULTURIST NOTES: Vigour and fertility in this block is very low resulting from the high Greywacke rock content. As a result the vines are treated differently to normal Sauvignon Blanc with only 2 canes laid, shoot thinned to 16 shoots, hand leaf plucked with a high 80% exposure. Very small berried and open bunches are typical in this block, with an average cropping level of 2.5kg per vine. At harvest the berries take on a blush appearance as it is ripened to around 24-25 Brix. One of the secrets to this block is that it holds its acidity level at high brix / ripeness levels. WINEMAKER NOTES: The fruit is hand-picked into small baskets. At the winery it is hand sorted then gently whole bunch pressed, and the juice fermented in French oak barriques (20% new oak). After fermentation the wine is aged in French oak barrels on yeast lees for 10 months. VITICULTURIST NOTES: Vigour and fertility in this block is very low resulting from the high Greywacke rock content.As a result the vines are treated differently to normal Sauvignon Blanc with only 2 canes laid,shoot thinned to 16 shoots, hand leaf plucked with a high 80% exposure. Very small berried and open bunches are typical in this block, with an average cropping level of 2.5kg per vine. At harvest the berries take on a blush appearance as it is ripened to around 24-25 Brix. One of the secrets to this block is that it holds its acidity level at high brix / ripeness levels. 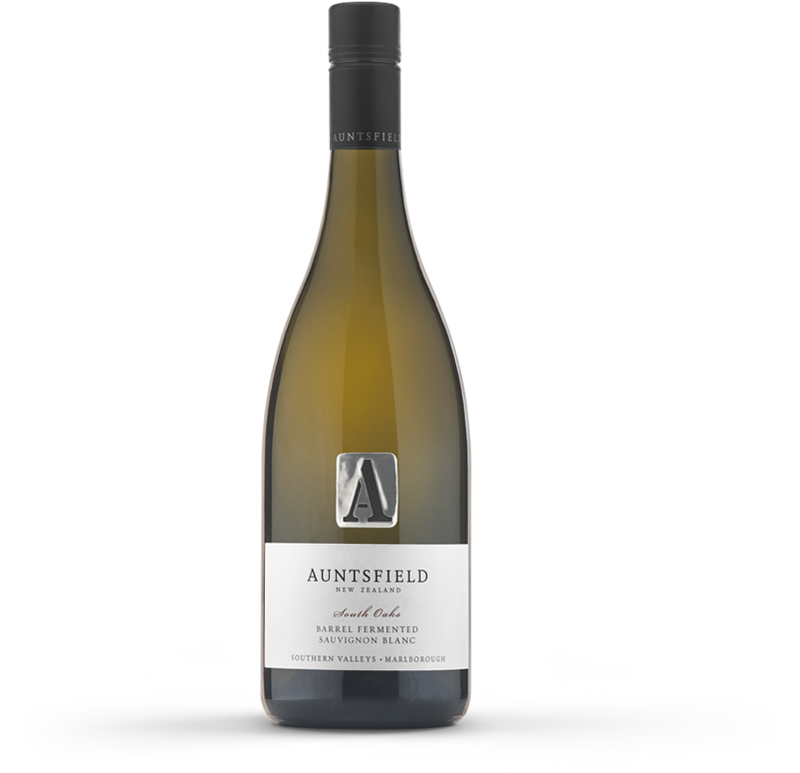 Complex and seductive bouquet of Sauvignon Blanc with aromas of crushed rock and mineral, floral notes and fresh ripe citrus and tree fruit with a slightly softer layer of herbaceousness then barrel ferment notes-spice and nuttiness. The nuttiness and flavour of barrel shows more distinctiveness on the palate with vanilla and oak. Peach and citrus peel notes with some herb and sweet nutty oak to follow. Crisp, dry, weighty and complex with a lengthy finish. Drink now through 2022. (‘South Oaks’ Barrel Fermented Sauvignon Blanc 2016). Barrel fermentation takes this in a smooth direction, filling out the fresh limes and green mangoes with a textural build to the finish. A smoothly integrated, refreshing and sophisticated sauvignon. (‘South Oaks’ Barrel Fermented Sauvignon Blanc 2016). Quite a fresh, weighty sauvignon blanc that achieves a nice balance between varietal flavours of gooseberry, passionfruit, guava and capsicum and subtle spicy oak character. Good purity, length and an appealing texture. (‘South Oaks’ Barrel Fermented Sauvignon Blanc 2016). Full, even, light straw-yellow colour with green tints. The nose is full with good depth and presence of ripe green stonefruits along with dark herbs and gooseberries melded harmoniously with a subtle layering of creamy, nutty oak, hints of toast and complexing oxidative suggestions, forming a concentrated, rounded core. Dry to taste and medium-full bodied, the palate has good depth and richness with a heart of complex interwoven flavours of ripe, green stonefruits with gooseberries and herbs, complexing nutty oak and oxidative hints. The flavours show with good presence, forming a solid heart, with fresh, lacy acidity lending energy and cut. The wine flows harmoniously to an elegant, lingering finish. This is a complex, oak-influenced Sauvignon Blanc with green stonefruits, gooseberries, herbs and nutty flavours, on a palate with good weight and complexing detail. Match with herb-marinated poultry and pork dishes over the next 3+ years. Hand-picked fruit from a 2 ha elevated corner block next to some old oak trees, WBP and fully barrel-fermented to 14.0% alc., the wine aged 10 months on lees in 20% new French oak. (‘South Oaks’ Barrel Fermented Sauvignon Blanc 2016). An impressively composed barrel-fermented style, the complex bouquet shows ripe citrus, white nectarine, lime zest and cedar characters with subtle oatmeal complexity. The palate is concentrated and powerful, and delivers excellent mid palate weight and fine texture, superbly structured by bright acidity. The wine is gloriously expressed and finishes with sustained zesty flavours. At its best: now to 2022. (‘South Oaks’ Barrel Fermented Sauvignon Blanc 2015). 95 Points. WINE ORBIT, March 2017.